Banana Macaron shells filled with Coconut Buttercream make a sweet and tropical treat. Decorated with royal icing, these will surely delight any Minion fan. Wouldn’t it be neat if you could have little helpers around the house with all your chores? What if they were adorable and fun-loving yellow minions? I made these macarons for my lil man’s birthday party back in April because he is such a big fan of the Despicable Me movies. These yellow guys love bananas, so to get the banana flavor in the macaron shells, I used freeze-dried bananas ground up in the food processor as well as banana extract. To get that bright yellow color that resembled a minion, I added a tiny drop of lemon yellow food coloring. For the filling, a buttercream frosting made with coconut cream is sandwiched in between to add a tropical burst of flavor. My favorite part was bringing these guys to life. It was so much fun adding all the little details. I used royal icing to pipe on the eyes and this food marker to draw on the hair, goggle bands and mouth. Even though these little critters won’t be able to help clean up any of those dishes, they certainly look adorable and are sure to be a hit at any party! Banana macaron shells filled with coconut buttercream make a sweet and tropical treat. 109 grams egg whites from about 3 eggs - aged at least 2 days. Let them sit out on the counter uncovered. In a medium bowl sift together almond meal, powdered sugar, and ground dehydrated bananas. Beat in the banana extract and yellow food coloring. Use a rubber spatula, gently fold the almond meal mixture into the egg whites. Only fold the batter in one direction by sliding the spatula into the center of the batter, then lifting it up and letting the batter fall back onto itself. It generally takes about 40-45 strokes to work the batter, but this number isn’t as important as how the batter looks. The batter is ready to pipe when it has a smooth, shiny surface and flows like lava in one large ribbon off the spatula. Pipe rounds onto prepared baking sheets, leaving space between the macarons to allow the batter to spread. Preheat oven to 300 F. When macarons are dry to the touch, bake *both trays at the same time (*if your oven has room, otherwise bake one at a time) for 12-14 minutes. Let macarons cool completely on parchment paper before removing and filling. In the bowl of your stand mixer, beat butter on medium high speed for 3 minutes until light and fluffy. Turn the speed to low and add coconut cream and powdered sugar, beating for 1-2 minutes until smooth. .Add in coconut extract is desired to intensify the coconut flavor. Turn mixer back on medium and beat for an additional 2 minutes until frosting is light and creamy. Fill a pastry bag with royal icing using a small round tip. Pipe eyes with white royal icing and pupils using black royal icing. Using another bag filled with blue royal icing, pipe outline of goggles around eyes. Using a food marker, draw on goggles, hair, and mouth. Can they be any cuuuter!!!??? Way, way too cute Kelly! Seriously, how can I not make these for my boys?? Pinned! Ahhh!! Kelly! These are too precious! So adorable!! Perfect for any age! I know a bunch of people at college who would love these!! Hahah!! YUM! so adorable… and I love the coconut cream filling.. how tropical indeed. Now, only if I had a few real ones to help me around the house. I bet your little man FREAKED when he saw these! I just love the Minions in Despicable Me. I want one of my own! Great idea using freeze dried banana! They are too adorable to eat, Kelly. I love those freeze dried banana chips. I loved these macarons when you posted about the birthday party a while back, so cute! Please mail these to me because I just recently had a macaron for the first time and they are my favorite dessert! These are absolutely adorable as well!!!!!!!!!!!!! Interesting you used freeze-dried bananas! Who woulda thought! I love the fact these are banana flavour as you now I love banana so much and these are just so cute I love them. I bet they went down like a storm at your lil’ guys party and I have to agree it would be wonderful to have a bunch of little helpers around the house 😀 Have a fab weekend! Kelly, these look so adorable and I bet they taste just as great. You are so brave (and talented) to flavor your macs with the banana. I can barely get plain ones to come out predictably…this is so impressive! Your little one is so lucky. The other moms at the party must have been equally thrilled and mad at you at the same time. ; ) You are setting the bar way high! Seriously – such a sweet treat for your son. I adore it! I love the combination of banana and coconut buttercream — they’re like tropical flavored little minions! I love the Despicable Me movies, and would eat way too many of these because they’re so flippin’ adorable! And tasty, too, I’m sure. 🙂 Your son must’ve been thrilled with these! These are so adorable, Kelly! Your little guy must have had so much fun at the bday party. I bet it was fun decorating everything too. I always remember really fun themed birthday parties my mom did for us when we were younger and they were the best! These are SERIOUSLY the best macarons ever!!! Oh goodness Kelly, you and these treats are just TOO CUTE! Oh my gosh these are so cute!!! I still haven’t attempted macarons…maybe one day. You totally went all out for your little man. Oh, my, Kelly! These are so cute! You always have the best ideas. And your macarons look perfect! SO darn cute! I bet your little guy loved them!!! These are absolutely adorable! Your son must have been thrilled – he’s so lucky to have you as a mom! You are so talented! These are adorable and I LOVE the filling! These are so darn cute Kelly – you make every dish (or dessert) you make SO fun. It makes me want to come live at your house! And, get to eat all those delicious (and adorable) goodies! TOO CUTE! Do they do dishes? Kelly these are so crazy cute!! Kind of in love with that coconut buttercream frosting! Oh my goodness! Adorable. My kids would swoon over these! Oh my, too cute! And that coconut buttercream looks delicious. I don’t even have any kiddos and I want to try them! Oh.my.goodness. Kelly, these are beyond adorable! Adding bananas to macaroons is plain genius. All those different frostings and the detail make these look so professional. I am so impressed, pinned! These are just so so adorable Kelly! I loved them when you posted about the party and they are still so so cool! And so impressive lady! Hope you’re having a great weekend!! These are adorable! My son is Minion-crazed. I can’t wait to make these for him. Ah, Kelly, these are DARLING! I cannot get over these! Plus, banana? You are a such an inspiration. One day I will make macarons again (I failed miserably the first time…) and will use your directions! WOW!!! We love the minions, I think I’m going to make these for my daughters graduation. So cute! Kelly, these are too too cute! I love all the little details you put into these. And incorporating the banana chips was a great idea. How creative! I’m sure your son must have been absolutely delighted with these! This is the best idea EVER!! Oh my gosh!! I’ve never wanted to make a macaron so bad in my life!! Super cute! Beautifully done decoration! The freeze-dried banana is an excellent idea. Nomm… I wonder what banana macaron would taste like. Man, I want some! I remember these from your birthday recap post! SO darn cute – you are so talented! 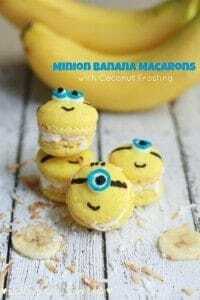 LOVE them, I’m doing a minion party in two weeks and can’t wait to make these!